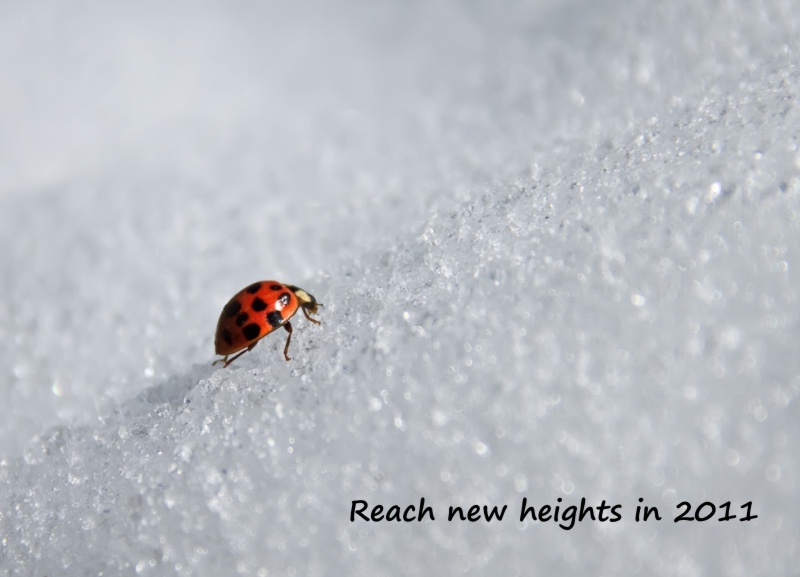 As the theme for our New Year 2011 cards we chose the "ladybug" - a small beetle which is typically associated with bringing good luck to the people who's path it chooses to cross. 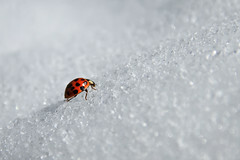 The front of the card shows a ladybug in a winter snow landscape, making its way uphill to a better (warmer, more comfortable) space. The picture was taken by Diane Hammond. This picture was used without any alterations or photoshopping. I only added the tagline written in the commercial Segoe Print Font. The tagline links the image (ladybug in a winter snowy landscape climbing uphill to a better place) with our best wishes for 2011: "Reaching New Heights in 2011". 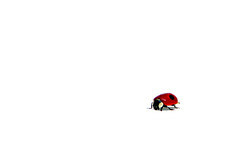 The back of our 2011 greeting card features another ladybug picture, taken by Ekkoj. The text uses the same font as the front side, Segoe Print. Most people believe that the number of 'dots' on the back of a lady bug are related to the age of the beetle - but that is just a myth. 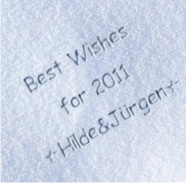 The text "Best wishes for 2011" is shown written in snow - an effect created using the website CAPTION IT (warning: this website attempts to install mallware on your PC !)). I would have loved to implement this snow effect myself in photoshop, but that proved to be a bit time consuming, so I reverted to using this webservice instead (as time was not on my side). The end result ? 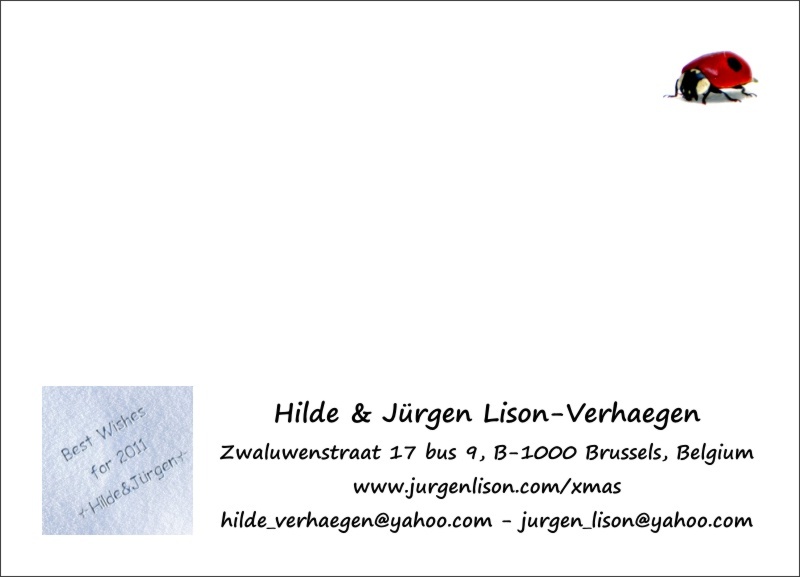 Below you'll find the front and backside of the printed cards. Mailed with handwritten addresses and most of them with special Christmas stamps (not all them, as the post office handed us some regular stamps as well). 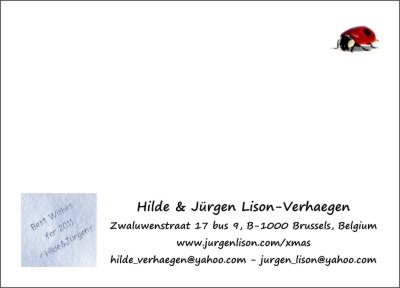 Interested in our 'older' New Year's cards ?